Every girl needs a dressing table and this little beauty is both feminine and functional! I agree 100%, your home should mirror who you are as a person, your style, your personality and your aura. I always try to keep this in mind when starting to design a new room. 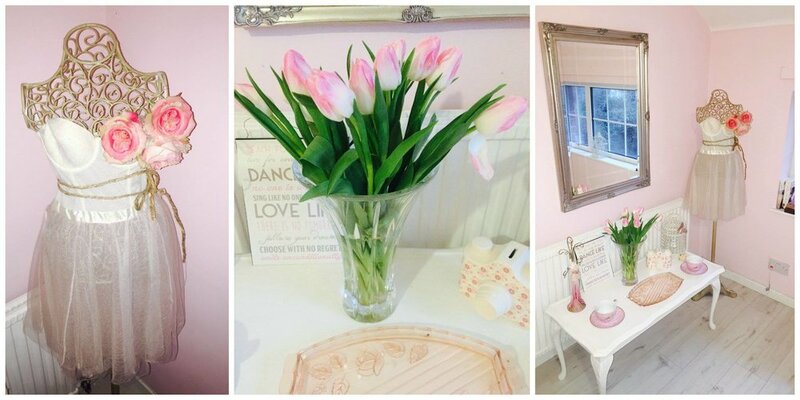 So how did I create the #PINK ROOM! In part 1 we updated a plain uninteresting room into a fresh pale pink delightful room with white woodwork and a beautiful new clouded oak laminate floor. With the hard work done, the room is now ready to add a little @DreamDIY magic. But where to start, from the beginning I always find is best. Keeping in mind this is a guest room I do not need a lot of storage so I donʼt have to worry about buying lots of furniture this means I can be a little bit more adventurous when choosing my statement pieces. When designing a room I always try and pick one piece of furniture as a feature and then base everything else around that. In this case, it was a set of furniture! As you know I love all things vintage so when I came across a little #1960ʼs #Formica #wardrobe and #dressing table set from @Oxfam, it was love at first sight - I knew they would be just perfect for our room. Both pieces came to £100 and the money is also going to charity so win, win I think! I can't stress enough just how much of a fan I am of #charityshops and #antique stores you really donʼt know what you can pick up! For example; the suitcase on top of the wardrobe was a bargain at £7.99! The wardrobe is more of a feature rather than being functional. l also hung a few dresses and a fur coat upon the door, just to bring the old fashioned look together. On my #dressing table, I have a few #Pink #Depression #Glass pieces that I have started to collect. With its warm rose colour and vintage beauty, the pink depression glass is hot items among collectors and antique enthusiasts. #Depression #glass is clear or coloured translucent glassware that was distributed free, or at low cost, in the United States and Canada around the time of the Great Depression. If you want to know more click the link: https://en.wikipedia.org/wiki/Depression_glass. Every now and then I have been lucky enough to pick up a few more pieces at antique fairs in #Carlingford and thrift shops up the town. Now, to the most important part of the room #THE #BED. This bed is from @Ikea, showing that old and new pieces can work well together. It was only £79 (eLEIRVIKWhite/luröy) which meant that we could invest in a good mattress, which we also got from Ikea. It comes vacuum packed so it was easy to bring home, it's actually amazing to see how it pops open. (I'm easily amused) In terms of comfort, it gets my @DreamDIY seal of approval. I love hearing the birds every morning when I wake up, so when I came across this bird bedspread from @Asda I had to buy it. I love adding throws to beds as it adds some extra texture. 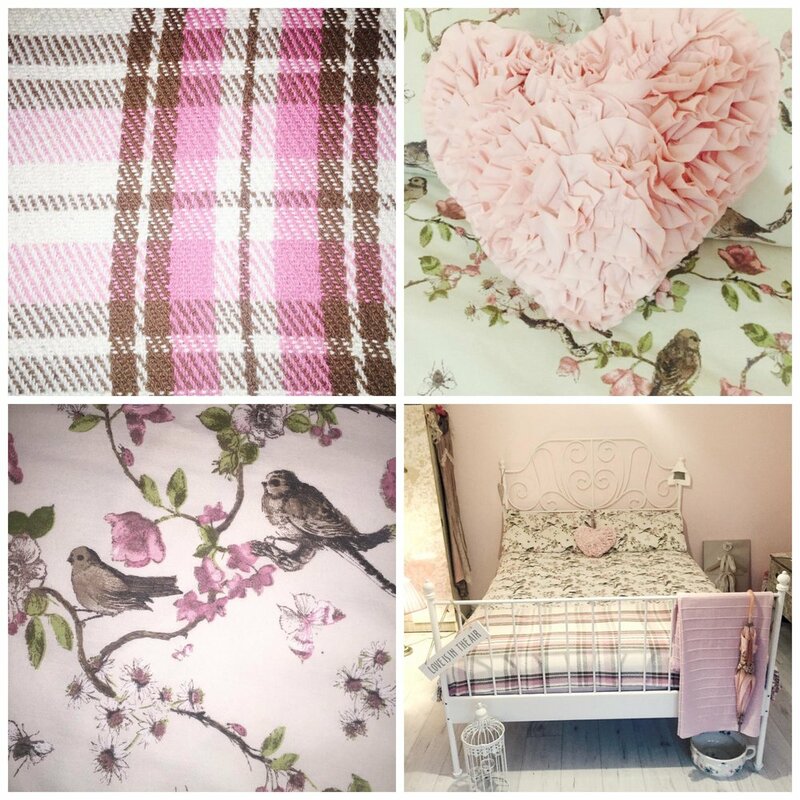 I teamed up the bedlinen with a pink tartan throw from @Matalan and a pink throw also from @Ikea. Pink cushion is from Matalan along with the pink tartan throw. I love my Bird bedlinen @Asda's best. White bed is from Ikea £79 for the frame only. Easy to assemble and can fit in an average size car. 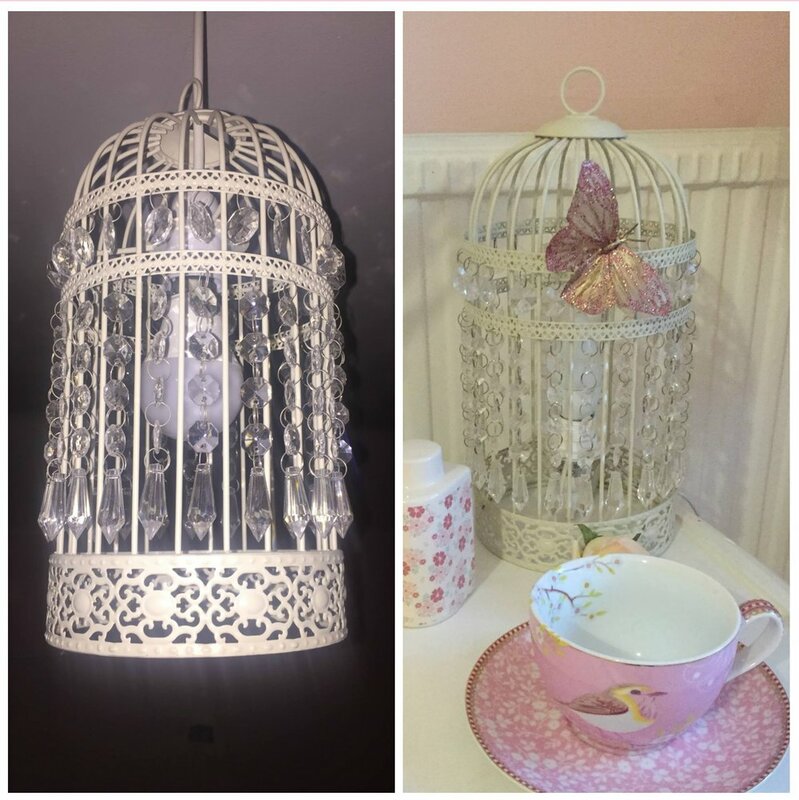 Keeping with the bird theme I was delighted to find a birdcage lamp and chandelier in Homebase - They are cream so nice and neutral. I think every bedroom should have a chair and this pink chair has been in every room I've ever had, so when I moved into my own house it had to come with me. This pink chair is about 20 years old, I can't remember it not being in my room! Good pieces of furniture can stand the test of time so every now and again do invest in a nice chair, it will never date. I love these Tulips they really brighten up the room. -The antique silver mirror is from B&MStores £14.99. Believe it or not, the little dress on the bust was £1 from Primark. I love how it softens the stand. To finish off the look I tied a little bit of rope around the waist. I love these artificial flowers I bought them in a local florists and I have put them all over the room. There is nothing nicer in a room than fresh flowers and these lovely little tulips are from Tescos. Close up of the lovely detail on the 1960's Formica wardrobe. it might not be everyone's taste but I love it! The gold detail is beautiful. I truly believe a room isn't complete without those little finishing touches, so next time you are decorating, take a trip to your nearest charity shop you'll be amazed at what you can find. And, don't be afraid to mix the old with new. Let me know what you think of my 'Vintage Va Va Room' or share some of you own designs. One room completed and I have to say I am tickled pink with excitement to start our next project!